Transparency International presented its Anti-Corruption Award to the Operation Car Wash Task Force from Brazil. The 14 gathered members threatened to resign over political attempts to undermine new anti-corruption legislation in their country. Meanwhile, the Latin American Investigative Journalism Awards recognised the fearless work of several reporters, with the top prize going to Mexico’s Laura Castellanos. Join us at 10:40 in the press centre (Contadora room) for the MoU signing ceremony between UNDP and Transparency International. It will be followed by a press conference with José Ugaz, Chair of Transparency International, and Magdy Martínez-Solimán, Assistant Secretary-General at the United Nations, where participants will have the chance to ask questions. Grand corruption is the abuse of high-level power that benefits the few at the expense of the many. So how do we fight it? At the IACC, panelists agreed international cooperation is critical. Is the stigma around whistleblowing beginning to subside? Panelists at the 17IACC shared experiences and talked about moving beyond basic legal protections toward a fuller understanding of whistleblowers. Read more. A plenary at the ongoing 17IACC in Panama focused on the link between corruption and human trafficking. Here are nine things you should know about it. 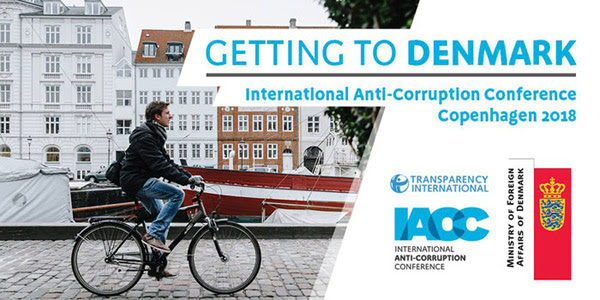 We are excited to announce that the 2018 International Anti-Corruption Conference (IACC) will be hosted in Copenhagen. No Comments to "#17IACC: Day 3 highlights"